Dr. Amy Gallegos was born and raised in Southern Colorado. She graduated from Woodland Park High School in 1994. She went on to earn her Bachelor of Science in Psychology from Colorado State University in 1998. After taking a year off to work in the Denver metro area as a ophthalmic technician in a Laser Center she went to Indiana to pursue her doctorate in optometry. She graduated from Indiana University with her Doctor of Optometry degree in 2003. Dr. Gallegos immediately returned to Colorado and has been practicing in the Denver Metro area ever since. Dr. Gallegos has one child a son, Tyus who graduated from Littleton High School in 2014 and Colorado State University in 2018. Dr. Gallegos comes from a large family where she is the oldest of five sisters. She now has multiple nephews and a nieces who all live in the area and she is spending much of her time trying to keep up with them. Her hobbies include keeping up with a large family, crafting, and golf. Her special interests include college basketball, the NFL, politics and wine. Brooke Fischer was born and raised in Littleton CO and is a proud graduate of Littleton High School and CU Denver. 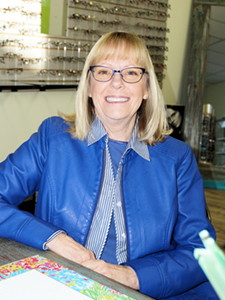 She has been working as an Optician for 15+ years in the Denver Metro Area. 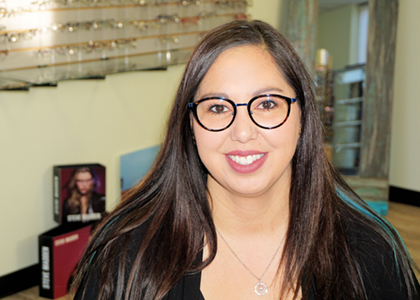 Brooke's passion in the optical world is the integration of the fashion side of Eye Wear with the technological advancements in lenses. She is enthusiastic about continuing to care for the community in which she has been a part of her whole life. Pam has been a Littleton resident for over 33 years. She and her husband of 38 years raised 3 sons and she enjoys her granddaughter with whom she spends time, when not at Eye Logic. Christmas, gardening, crafting, her dog Dudley and family are her passions outside of work. 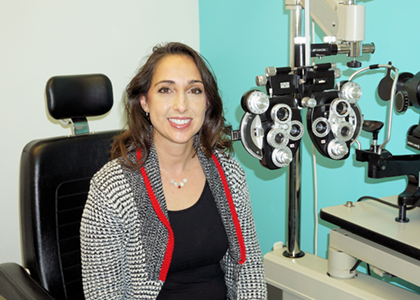 Pam has over 5 years experience in the eye care industry. She has over 25 years in early childhood development covering positions ranging from teacher to director. Pam has a degree from Phoenix College in the legal field.